I completely forgot when I was patting myself on the back about reading Pride and Prejudice last month that I had also read the Complete Works of Beatrix Potter. So go me two classics! Now four! Honestly the Beatrix Potter and A Madeline Treasury were really cute, great illustrations and I’m glad I read them but definitely not my thing. Growing up I always had a closer affinity for not just Pooh but the whole gang in the Hundred Acre Woods. Casey is about to start high school, abandoned by her best friend and dealing with parents who don’t seem to want her to grow up when they take their annual summer trip to Disneyland. While there and miserable she meets Bert and the two spend the next two days together exploring the park, their feelings, annoying people, parental issues and generally learning that growing up might just be okay. I have this weird thing with Disneyland and Las Vegas. While I’ve lived in the OC (until recently) for years I can count the number of times I’ve been to Disneyland on my two hands. Yet every time I do go it’s like I lose my mind. I always have fun. (Well, I’m not counting the one time I only made it a half hour. FYI, if you’re trying to get past a headache and the pills actually seem to be working Space Mountain is not where you want to start the day.) I always turn back into a kid. I don’t worry about the lines, the money or the time and the minute I have to leave I’m planning my return even though it wears off in a couple of days and I forget about it until the next time. This is a young book but not young in an annoying and I feel old way. More like nostalgic and sweet (although Casey’s whining did at times get a little annoying). Bert is a little to perfect of a human being and like I said Casey does get a little whiny and repetitious but we’ve all been there. I looked at it like a fairy tale in the happiest place on Earth. A semi-coming of age we’re all going to be okay story. So it seems like the good Disney vibes affected me. Recommend: Yes. Just be aware that it’s a little young and sappy. It really reminded me of the days when I was reading Sweet Valley High and the Babysitter’s Club. I enjoyed it. This book also fulfilled the “Photograph on the Cover” for the Great Imaginations Story Sprite contest which was a little harder to find than I thought it would be. Someone who can’t get there life into gear and has no idea how? Sign me up! 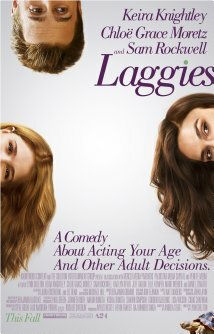 This is an enjoyable movie that kicks into gear when she gets to Annika’s house and meets her adorable father Craig (Sam Rockwell). I related a great deal to Megan and Keira’s her charming self. I actually liked Chloe here more than usual probably because she’s not overly important and is playing an actual average teenager instead of some super teen. And I liked Sam Rockwell so much that I actually could have gone for a little more romance. Megan doesn’t make the best decisions by far but she’s understandable and I thought the movie made it pretty clear where she was headed career wise. There are some issues that are dealt with including abandonment, an affair, teenage drinking (with the help of an adult) and an adult hook-up. So if you’re stuck inside this weekend with the bad weather or even if you’re not I’d totally recommend this movie.